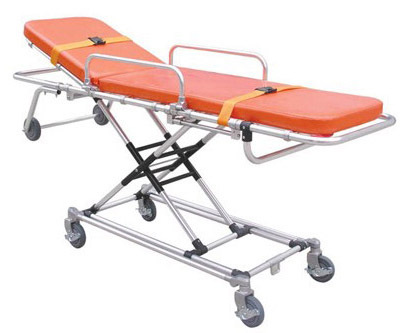 Non-Emergency Medical Stretcher. Aluminum alloy stretcher is easy to operate. Height is adjustable by pressing the height handle. The mattress is a thick foam cushion with an adjustable back to help the patient feel comfortable when transporting. Shown in Orange. Also available in Black (with an additional 2 week lead time). Includes two straps to secure the patient. Stretcher is also equipped with security locks. We've got you covered with the healthcare equipment and radiology accessories you need.